Alright… it was also partly because papa had just done his cataract and eye Lasik surgery. So, I thought it would be nice to make some of these chrysanthemum and wolfberries goodies for him. Adding of bird nest was mainly for my benefit, and it sounded perfect for everyone, since we all liked bird nest! Despite the extra effort to boil and filter the chrysanthemum petals and worlfberries, this konnyaku dessert is very simple to make as the konnyaku jelly premix is easily obtainable from major supermarket at a very economical price. I got the Redman brand konnyaku power premix (already blend in malic acid and sugar) from NTUC Fairprice at about S$2.50 for 250gram packet. As for the chrysanthemum , I used the better graded chrysanthemum flower, Gongju (贡菊), which has smaller and more compact petals. These dried flowers are usually packed and sold at any Chinese medical halls or Asian supermarkets for S$5 – $7 a packet. Another type of white chrysanthemum (杭白菊) which has bigger petals is good, too. Its main benefit is to aid for better eye sight, while the one I used is mainly to clear the ‘heatiness’ in the body, and it is less sweet but stronger in taste. The usual yellow chrysanthemum (野黄菊) which yields slight bitterness aftertaste, is also fine to use. Generally, all types are good and beneficial to be consumed, but my personal preference is the small ‘Gongju’, which deemed the best suitable for making jellies. How about the bird nest? Real bird nest used? Yes, I used the instant Guan Yan Zhan (官燕栈) bird nest from Lo Hong Ka for my daily consumption ever since into second trimester of my pregnancy. Alternatively, use the bottled bird nest (in heavily sweetened liquid). If this is the case, I would suggest an alternate type of konnyaku jelly power which is unsweetened so that you could use the whole bottle of bird nest together with its sweetened liquid. Anyway, Matthew (one of the fans from my FB fan club wrote on my wall) was right. This sounds like a perfect summer snack (smile)! 1) Boil water in a large pot over high heat. When boiled, add chrysanthemum and wolfberries and use a spatula to gently mix it. Bring the ingredients to a boil again before heat off. Thereafter, cover pot with lid to let it stand for another 10 minutes in order to let flavour released even greater. 2) Use a clean strainer to filter the flower petals and also remove the wolfberries bag from the pot (keep the wolfberries for use later). Retain the chrysanthemum water in the pot and reheat on low fire. Now, add Konnyaku jelly mix gradually. Keep stirring the mixture while simmering for about 5 minutes. Heat off and wait for the bubbles to dissipate. 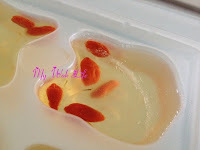 3) Remove the wolfberries from the tea bag and split them equally among the jelly moulds. Pour the boiled jelly mixture into moulds and leave it to cool at room temperature for 3 minutes. Then, add in the bird nest. Let it cool for another 5-10 minutes before chilling it in the refrigerator. Ready to serve. 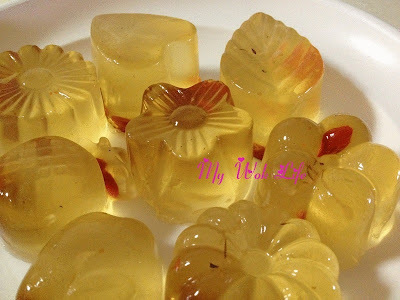 Alternative way to make this jelly:**Add gelatin sheets/ powder to firm (directions on the right amount to use should be stated on its packaging), and sugar to taste, into the boiled chrysanthemum water, instead of konnyaku jelly powder premix. 1 jelly counts less than 10kcal. Tips: It’s ok to leave out a little bit of these edible chrysanthemum petals in the pot. These tiny petals will only make your jellies looked even nicer, and its insignificant amount won’t affect the taste and mouthfeel of the jelly. If you really mind eating even a single petal, use a large disposable tea/ soup bag to boil the chrysanthemum, then. * Some konnyaku jelly brands come with flavour/ colour. Don’t use the flavoured konnyaku jelly powder. Original pre-mix powder is the best as the chrysanthemum tea will yield natural yellowish colour in the jelly which looks very nice and natural. * Do not discard the chrysanthemum just after one time boil for the jelly making. Simmer the same chrysanthemum again in a pot of hot boiled water (for 1 minute then cover pot with lid to let it stand for another 5 minutes) for the second time and to be drank as tea.